CLICKBANK is a mult-million dollar company that offers an Affiliate Marketing program. You can sign up to sell thousands of ClickBank products and earn a healthy commission for doing so. You don't have to purchase the products to sell them. Our Members told us they like ClickBank but found it difficult to know and find the best products to sell and didn't know how to market them. 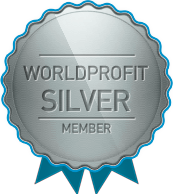 To meet this need, we created the CB Promo Kit and made it free for all Worldprofit Silver and Platinum VIP Members. In this lesson, we introduce you to the CB Promo Kit. Worldprofit has made it easy for you to sell ClickBank products and has a section in the Member area devoted to ClickBank. You can locate this from the left menu under the heading CLICKBANK. The CB Promo Kit allows you to promote ClickBank products to your Prospect Manager List, or to your Newsletter list with the click of the button. We provide you with a list of the TOP-SELLING hot and recent products in the home business and marketing genre. We provide you with the marketing materials to promote each product.